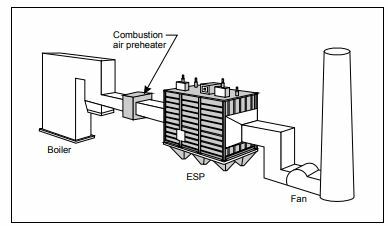 An electrostatic precipitator (ESP) is a filtration device that removes fine particles from a flowing gas through the use of an induced electrostatic charge. ESPs apply energy only to the particulate matter being collected, thus it is very efficient in its consumption of energy. This is a departure from typical processing applications which apply energy to the entire gas stream. Electrostatic precipitators are best suited to a narrow band of applications, typically in exhaust and breathing air applications. Specific applications include the removal of dirt, oil mist, acid mist, sulfur, and bacteria. ESPs may be located in steam plants, blast furnaces, ventilation systems, and medical settings. There are two primary types of precipitators: wet and dry. Both types of electrostatic precipitators have similar physical sizing considerations. Dry electrostatic precipators are best for larger particle removal (10 microns and above), whereas wet electrostatic precipitators are best suited for submicron applications. Generally speaking, dry ESPs are a control device to remove heavy particulate loads while wet ESPs act as a final polishing device. Dry ESP design configuration typically consists of a gas flowing between two plates and is referred to as a “platetype ESP”. Discharge electrodes are located in the center and collection electrodes are located at the wall. The combination of these electrical fields allow for contaminant collection at the walls. Contaminants are removed by physically rapping the walls. Rapping occurs while the collection process is ongoing and the frequency and intensity is controlled according to the contaminant composition. Rapping intensity and frequency will be specified according to process media of the gas, flow rate, and the molecule entrapment rate. Partiulate resistivity , the measure of a particle’s ability to resist electrical flow, is an important consideration. Dry electrostatic precipitators work well with particles that have medium resistivity. Low resistivity particles tend to collect build-up quickly on electrodes and high resitivity particles experience back corona – electrical discharges that reduce collection efficiency. Wet ESPs come in two major physical configurations: plate and tubular. The tubular variety has a higher efficiency than its plate counterpart and is available in several different geometries. Cleaning of a tubular ESP is more challenging due to accessibility challenges. Choosing the right configuration ultimately depends on available space, gas volume, outlet specifications, utility usage, and maintenance access. Wet electrostatic precipitators are employed in saturated gas service and ensure precipitation of aerosols reach minimum pollutant levels in the cleaned gas. Removal of SO3, TiO2 and tar are common applications. Wet ESPs are a good fit when explosion chances are high and/or when the dust is sticky and/or corrosive. The water flow may be applied continuously or intermittently to wash the collected particles from the collection electrodes into a sump . Particulate resitivity is less of a concern for wet electrostatic precipitators. This is because electrodes are continually cleaned with water wash, minmizing back corona and clogged collection electrodes. Particulate resistivity is typically not a factor in the wet electrostatic selection process. Management of particulates is much easier when routed in conjunction with a preheater. An appropriately sized heater will ensure that temperature is elevated above the dew point. If the temperature drops and the gas reaches the dewpoint, particulates in the gas stream condense, leading to blockage. This will trigger reduced efficiency, increased maintenance costs and at times, catastrophic failure. Is an ESP right for my application? Electrostatic precipitators are specialty gas processing technology. While its band of applications are small, when used in the right scenario, electrostatic precipitators can bring tremendous value. Use the Punchlist Zero selection tool to determine whether a wet or dry electrostatic precipitator is the right fit for your application.